On 7 November, BHL officially received the Digital Library Federation (DLF) 2016 Community/Capacity Award. The award, the first given by the DLF, was shared with the American Archive of Public Broadcasting. BHL was honored to be selected by DLF members from an outstanding list of nominees. Joining BHL Program Director on stage to accept the award from DLF Director Bethany Nowviskie were BHL Member representative Kelli Trei (University of Illinois, Urbana-Champaign), and Jacqueline Chapman and Joel Richard from Smithsonian Libraries. 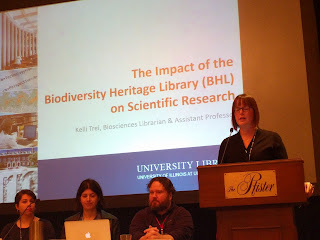 Representatives from BHL included Anne Kenney (University Librarian, Cornell University Library, Keri Thompson (Smithsonian Libraries), and Karl Blumenthal (Internet Archive). Announcing DLF’s 2016 Community/Capacity Award Winners! The 2016 DLF Forum also included a presentation by Trei, "The Impact of the Biodiversity Heritage Library on Scientific Research." The presentation details a study evaluating the scientific impact of the digital Biodiversity Heritage Library (BHL) through topic modeling and analysis of a series of interviews with scientific researchers featured in a BHL blog.